She says there wasnt enough funding for this years event. They accept a grant from the City of Spokane most years and this year the Parks and Recreation Department offered to wave $12,000 in fees. Still, that wasnt enough. Major donors like Avista were able to pitch in, but Warren went on to explain that the downturn in the economy put a dent in donations from small businesses and the community. via Downtown Spokane Pow Wow Canceled Due To Lack Of Funding – News Story – KXLY Spokane. July 2011 preliminary unemployment estimate is 9.0%. 2010 average unemployment figure was 9.74%. From Jan-Jul, 2011, the average is 9.514%. Last month: Spokane area unemployment worsens in June 2011 « Spokane Economic And Demographic Data. 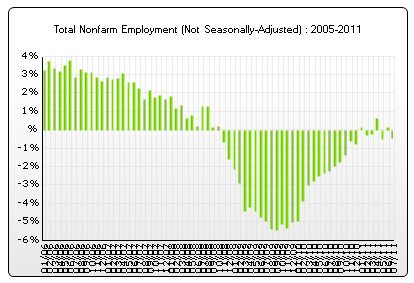 In the data table that follows, the drop in non-farm employment to 201,100 is troubling. That is about 16,000 fewer jobs than in the same month in 2008 and is fewer jobs than in July of last year. While the employment situation has stabilized, the following chart shows that the area has continued to lose jobs. We should watch this chart carefully over the next few months to see if we are headed back into recession, or just bouncing along the break even point. This chart shows the year-over-year change in employment. All of the recent green bars below the zero line indicate losses. We do not want to stabilize here as that would mean we have stabilized at a new, lower employment level. 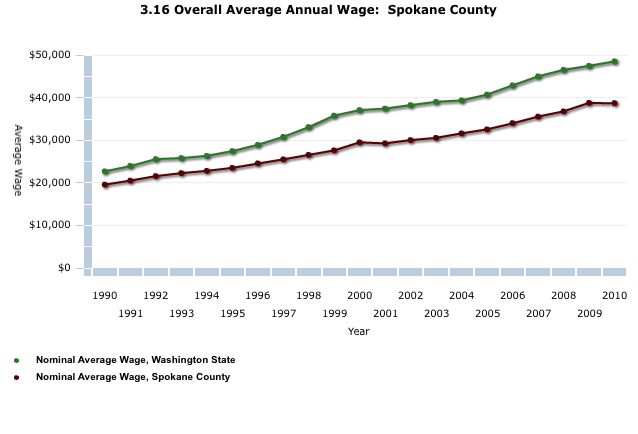 Good news – inflation adjusted average wages in Spokane County have gone up from 1990 to 2010. Bad news – wage growth from 2001 to 2000 was 13.7% but wage growth from 2001 to 2009 was 5.5%. The second period was selected to start from the lowest post 2000 wage (the bottom in 2001) to the end of the series in 2010. The first period was selected to start in 1991 and run to 2000 (local peak) so that the same number of years would be in both groups. What it means: Wage growth in Spokane was much lower after the peak in 2000 and is now growing less than half as fast as prior years. Oddity: Why did average wages shoot up in 2008 and 2009 in the midst of the worst recession since The Great Depression? Lower wage earners were laid off their jobs. Eliminating lower wage workers causes the average to rise. Bottom line: Since 2000, average pay in Spokane has risen at a slower rate than prior to 2000. That’s unfortunate. Reminder: The “average” is not the same as the “median”. 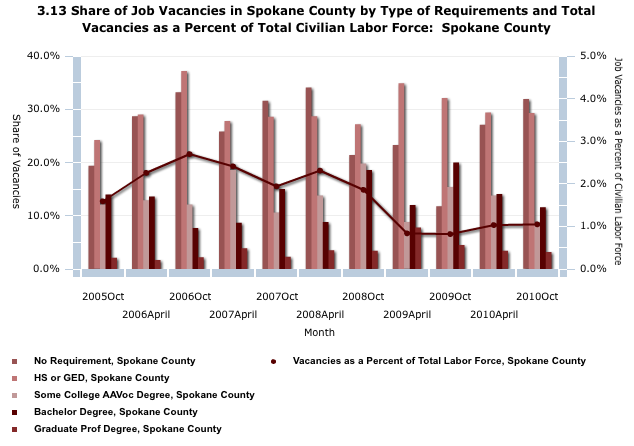 The chart is taken from the fantastic Community Indicators of Spokane web site. Some day I will try to produce a version with inflation adjusted average wages. Currently, the average wage in Spokane County is about 20% less than that of Washington State. It is apparent from the chart that the difference is growing wider over time. FDIC: Press Releases – PR-132-2011 8/5/2011. 12 of 20 Whitman branches are being shut down and 8 will be taken over by Columbia State Bank. Because Whitman was an employee stock ownership program bank, those employees with stock will lose their entire stock ownership value, as well as losing their jobs. Previously, the two largest local regional banks, both based in Spokane (Sterling and AmericanWest), largely failed, as did a local credit union. These local banks made many local construction loans. With tighter contraints on lending now in effect, there will likely be less lending available for local construction projects and small businesses, which could slow Spokane’s economy further. Other regional banks include Wheatland Bank, Bank of Fairfield, Washington Trust Bank and Inland Northwest Bank. Incompetent management or poor economy in the Spokane area? Your choice. I lean towards bad management since many other banks did not fail.